Persepolis (تخت جمشيد Takht-e Jamshid or پارسه Pārseh), literally meaning “city of Persians”, was the ceremonial capital of the Achaemenid Empire (ca. 550–330 BCE). Persepolis is situated 60 km northeast of city of Shiraz in Fars Province in Iran. 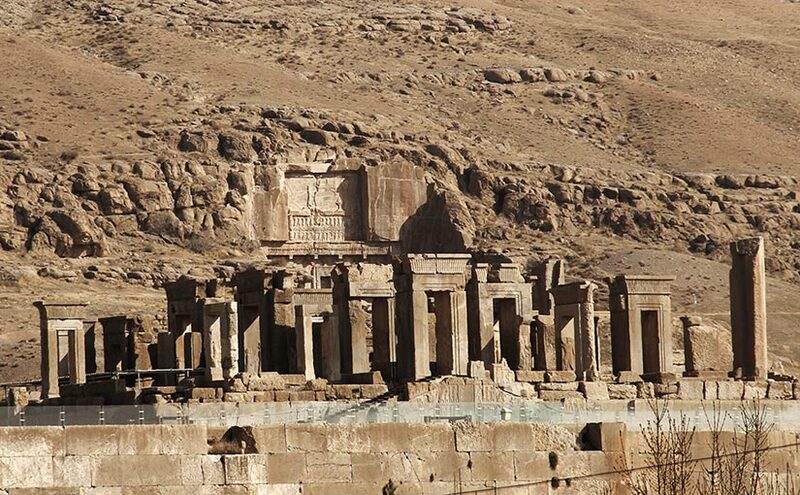 The earliest remains of Persepolis date back to 515 BCE. It exemplifies the Achaemenid style of architecture. UNESCO declared the ruins of Persepolis a World Heritage Site in 1979. Darius ordered the construction of the Apadana Palace and the Council Hall (the Tripylon or three-gated hall), the main imperial Treasury and its surroundings. These were completed during the reign of his son, King Xerxes the Great. Further construction of the buildings on the terrace continued until the downfall of the Achaemenid dynasty. Persepolis is near the small river Pulvar, which flows into the river Kur (derived from Persian word Cyrus / Kuroush). The site includes a 125,000 square metre terrace, partly artificially constructed and partly cut out of a mountain, with its east side leaning on Kuh-e Rahmet (“the Mountain of Mercy”). The other three sides are formed by retaining walls, which vary in height with the slope of the ground. From 5 to 13 metres on the west side a double stair. From there it gently slopes to the top. To create the level terrace, depressions were filled with soil and heavy rocks, which were joined together with metal clips. Around 519 BC, construction of a broad stairway was begun. The stairway was planned to be the main entrance to the terrace 20 metres above the ground. The dual stairway, known as the Persepolitan stairway, was built in symmetrically on the western side of the Great Wall. The 111 steps were 6.9 metres wide with treads of 31 centimetres and rises of 10 centimetres. Originally, the steps were believed to have been constructed to allow for nobles and royalty to ascend by horseback. New theories suggest that the shallow risers allowed visiting dignitaries to maintain a regal appearance while ascending. The top of the stairways led to a small yard in the north-eastern side of the terrace, opposite the Gate of Nations. Grey limestone was the main building material used in Persepolis. After natural rock had been levelled and the depressions filled in, the terrace was prepared. Major tunnels for sewage were dug underground through the rock. A large elevated water storage tank was carved at the eastern foot of the mountain. Professor Olmstead suggested the cistern was constructed at the same time that construction of the towers began. The uneven plan of the terrace, including the foundation, acted like a castle, whose angled walls enabled its defenders to target any section of the external front. Diodorus writes that Persepolis had three walls with ramparts, which all had towers to provide a protected space for the defense personnel. The first wall was 7 metres tall, the second, 14 metres and the third wall, which covered all four sides, was 27 metres in height, though no presence of the wall exists in modern times.